Richard Chandler is a friendly, professional and reliable master cabinet maker who has been designing and making furniture for over 15 years. All products are made to the highest quality at affordable prices. This includes made-to-measure wardrobes, bedroom suites, kitchen cabinets, bathroom cabinets, radiator covers, children's interactive furniture, storage solutions and garden furniture. 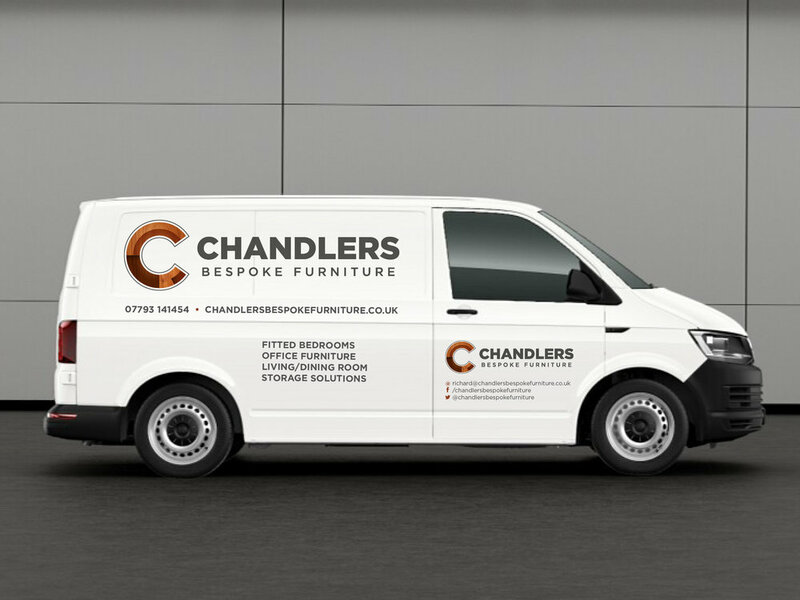 Chandlers Bespoke Furniture is based in Birmingham but covers all areas in and around the West Midlands. Richard required a new logo for his business and approached us for the design. After meeting with him and discussing all of the services that he offers, we quickly realised that we needed to create a unique brand reflecting the bespoke furniture that Richard makes. Our solution uses the ‘C’ of Chandlers as a monogram styled with a selection of wood finishes, echoing the mahogany, oak and alder finishes available from Chandlers. This fuses the brand's identity with its service, echoing the wood furniture design and giving a clear impression of what the company is about. The end result was a striking logo that stands out on both dark and light backgrounds and that accurately represents the services provided by Chandlers. The logo was then rolled out to social media, stationery, T-shirts, mugs and vehicle livery, creating a consistent, professional brand.